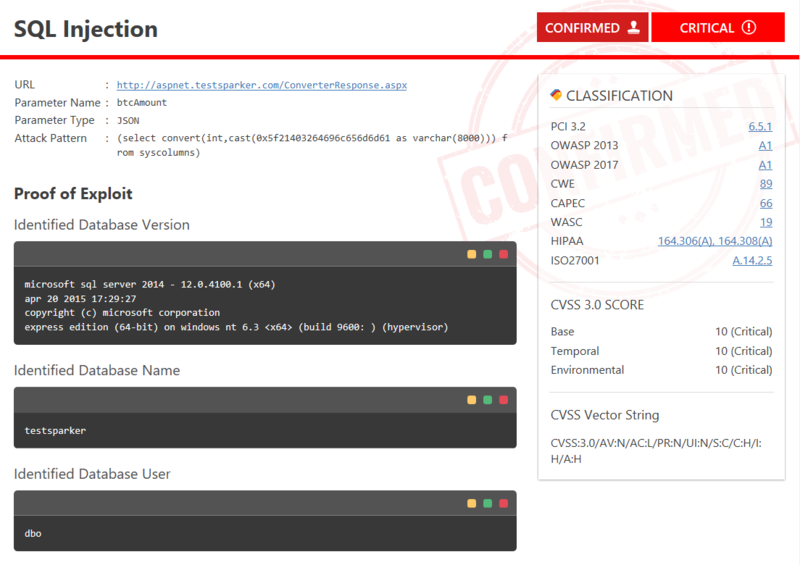 Netsparker web application security scanner scans for a wide variety of vulnerabilities in websites, web applications and web services. Each vulnerability has a different impact; some need to be addressed urgently, while others are less of a priority. For example, a SQL Injection vulnerability should definitely be prioritized over an Internal IP address disclosure. In addition, there are Informational Alerts. For further information, see our full list of web vulnerability checks. This section explains how we define and identify web vulnerabilities of Critical severity. 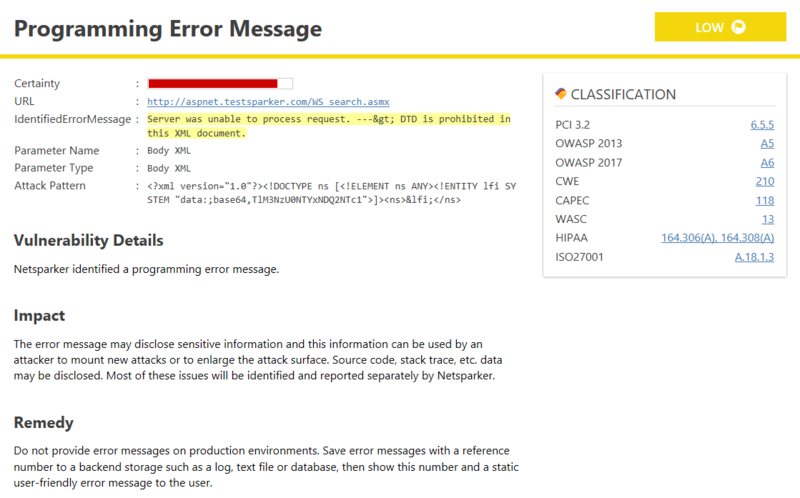 This is what a report of a Critical severity vulnerability looks like in Netsparker web application security scanner. By exploiting a critical severity vulnerability, attackers can access your web application's database. This allows them to acquire user and administrator information that might allow them to make changes such as delete or modify other user accounts. On exploiting such vulnerabilities, attackers can access and control logged-in user or administrator accounts, enabling them to hijack accounts and make changes that typically only those users can. A Critical severity vulnerability means that your website can be hacked any time. You should make it your highest priority to fix these vulnerabilities immediately. Once you fix them, rescan the website to make sure they have been eliminated. This section explains how we define and identify web vulnerabilities of High severity. This is what a report of an High severity vulnerability looks like in Netsparker. 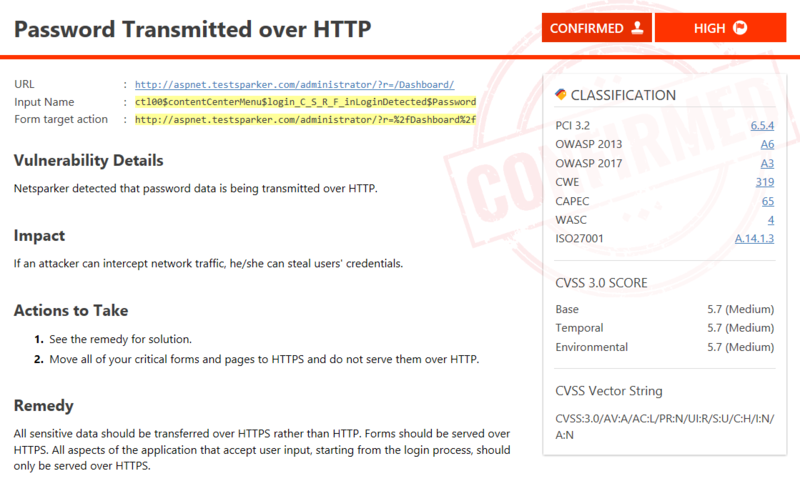 Attackers can find other vulnerabilities, and potentially your database passwords, by viewing your application's source code. On exploiting such vulnerabilities, attackers can view information about your system that helps them find or exploit other vulnerabilities that enable them to take control of your website and access sensitive user and administrator information. A High severity vulnerability means that your website can be hacked and hackers can find other vulnerabilities which have a bigger impact. Fix these types of vulnerabilities immediately. Once you fix them, rescan your website to make sure they have been eliminated. This section explains how we define and identify web vulnerabilities of Medium severity. This is what a report of a Medium severity vulnerability looks like in Netsparker. Attackers can access a logged-in user account to view sensitive content. By exploiting these security issues, attackers can access to information that helps them exploit other vulnerabilities, or better understand your system so they can refine their attacks. Most of the time, since the impact of Medium severity vulnerabilities is not direct, you should first focus on fixing Critical and High severity vulnerabilities. However, Medium severity vulnerabilities should still be addressed at the earliest possible opportunity. This section explains how we define and identify web vulnerabilities of Low severity. This is what a report of a Low severity vulnerability looks like in Netsparker. Do not overly concern yourself if your website has low severity vulnerabilities. These types of issues do not have any significant impact and are not exploitable. If time and budget allows, it is worth investigating and fixing Low severity vulnerabilities. This section explains how we define and use Information alerts. We do not even call these alerts vulnerabilities. They are reported simply for your information as a website owner. No action or fix is required. It is just sometimes good to know about things that are on your web application such as: NTLM Authorization Required, Database Detected (MySQL), Robots.txt Detected, phpMyAdmin Detected or Out-of-date Version (jQuery). The status of these Issues is set to Accepted Risk. Issues with Accepted Risk status are listed in the Addressed Issues window. What is the Difference Between Netsparker Enterprise and Netsparker Standard?